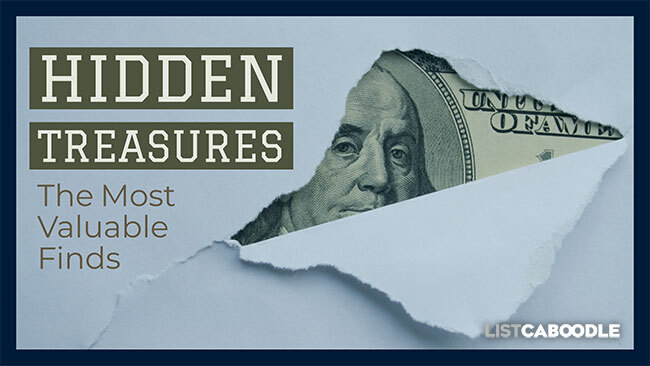 You’ve likely heard stories of hidden treasures found in walls during the remodeling of a kitchen or valuables found in the rafters of a house. Treasures are found all the time, long hidden away and forgotten by time. This list features some of the notable hidden treasures found in attics, walls, garage sales and thrift stores over the past several years. After learning about these discoveries, you may be inspired to find your own! Most people are familiar with Washington’s hair style from his iconic portrait on dollar bills. A common misconception is that he wore a wig. In fact, as a young man his hair was red. Washington powdered his hair white, in custom with the times. In later years, his hair became whiter naturally. The lock of hair had most likely been given by the President as a gift. The practice of giving hair as a keepsake was common at the time. One day in 2013 a middle-aged couple were out walking their dog in northern California gold country. They encountered a rusty can sticking out of the ground on the path they walked. The man dug out the can and found it was full of mint condition gold coins from the late 1800s. More digging uncovered a total of eight cans containing 1,427 coins. The face value of the coins was $27,980, but the assessed value of the lot totaled $10 million. The find is now known as the Saddle Ridge Hoard. In 2011 a North Carolina man purchased an old tintype photograph at a flea market. The photo was a portrait of five men from the late 1800s wearing cowboy hats and looking tough. The buyer, Frank Abrams, paid $10 and hung it at his home. Abrams realized after some online researching—and several years had passed—that one of the men looked strikingly like Pat Garrett, the man that killed Billy the Kid. He took the photo to experts, who verified that Garrett was the man on the far right of the photo. They also told him the second man from the left was Billy the Kid himself! Billy the Kid photos are rare and highly prized by collectors. A recent Billy the Kid photo find (see Croquet Photo below) was valued at about $5 million. In 2010 a man paid $2 for a old tintype photo of a group of people playing croquet in front of a cabin. Expert authenticators identified Billy the Kid in the photo holding a croquet mallet and wearing a top hat. The photo was taken at the New Mexico ranch owned by cattleman John Tunstall. Tunstall hired Billy and his gang to defend against cattle rustlers and rival ranchers. The appraised value of the tintype photo is $5 million. A good return on a $2 investment! In 2017 a Tennessee man was going through the attic of his deceased uncle. In an old box he found nine boxes of unopened baseball cards. The packs were from the mid 1900s. The most valuable item was a box of 1948 Bowman baseball cards. It contained 19 unopened packs from the company’s first year. The appraised value of the Bowman set alone is a half-million dollars. The total find may be worth over $1 million. In Defiance, Ohio a family was cleaning out their aunt’s house. They discovered a bunch of baseball cards in a box, bundled together in twine. The cards looked different than usual. They were more narrow than today’s cards and obviously very old. Some of the names on the cards—Cy Young, Honus Wagner and Ty Cobb—indicated they could be of significant value. The family learned that the cards—given away with tobacco products in 1910—were worth about $3 million after consulting with expert appraisers. Valuable items are often found during remodeling of older homes. In 2013, a house in Minnesota was being renovated. A contractor discovered a rare comic book in a wall he was tearing down. It was the first-ever appearance of Superman in Action Comics No. 1 from 1938. The comic had been used along with newspapers to insulate the walls. The rare comic sold for $175,000 at auction. It is one of about 100 copies known to exist. This next story will make you want to check your local thrift store. In 2015 truck driver Teri Horton bought a painting at a thrift store for $5. She believes it is an original masterpiece from the abstract expressionist Jackson Pollack. Experts disagree on whether it is real or not. But if it is, it could be Horton’s winning lottery ticket. A Pollack painting called “Number 5” recently sold for $140 million. It’s not often you find 1000-year-old Chinese treasure at a local garage sale. But that is what happened to a New York family several years ago. They paid $3 for a rather plain looking ceramic bowl. The bowl sat on a mantel for years until the family consulted experts to find out its value. Appraisers determined that the bowl was from the Northern Song Dynasty (960 to 1127 AD). Sotheby’s auction house sold it for $2.2 million in 2013. A Pennsylvania family thought there might be cash or other hidden treasures in the old family home. They were right. Inside the walls they discovered thousands of dollars of old, valuable coins. The coins’ face value equalled $8,500 but the collectible value is close to $200,000. The home had sat unoccupied for almost 20 years before revealing its hidden treasures. In 1989 a Pennsylvania collector bought a $4 painting at a flea market because he liked the frame. When he got it home, he discovered a first printing of the Declaration of Independence had been hidden behind the painting. The condition of the print was preserved by its location between the painting and its backing throughout the years. At the time, only 24 copies were known to exist. He sold the Declaration for $2.4 million at a 1991 Sotheby’s auction. In 2006 a remodeler tore down a false wall in his home, revealing an original painting by Norman Rockwell. Donald Trachte, Jr. said his father must have hidden the valuable painting for his children to find. An illustrator by trade, Trachte Sr. purchased the painting from Rockwell in 1960 and decided to make a copy to display instead of the original. “The Saturday Evening Post” featured the painting, called “Breaking Home Ties,” on the cover in 1954. The painting’s appraised value is around $5 million. Good luck came to a man out in his garden in the summer of 2011. Wayne Sabaj, an unemployed carpenter, found bags of cash buried amongst the broccoli plants. The total value of the find was $150,000. Several people contested ownership of the money. Unfortunately, Sabaj would die before he could collect any of the money. In 2001 two sisters sorted through their father’s estate after his death. They found many hidden valuables including gold and cash. After a thorough cleaning, they sold the house. But had they found all of their father’s hidden treasures? The new home owners hired contractors to make some repairs. Inside the walls they found cash-filled ammunition cans. The find was worth $500,000. A dispute occurred over ownership of the money; the sisters and buyers of the house went to court to work out an eventual split of the money. In 1990 a discovery was made in a California attic. Inside a trunk was the missing handwritten manuscript for “The Adventures of Huckleberry Finn.” The famous book by Mark Twain was first published in 1884. The finding included the rare draft along with other old documents and letters from important authors. James Gluck collected the material in the late 1800s. Imagine finding $30,000 in cash under the floorboards of your home! Home remodeler Andy Rasmussen found an old bag of $20s and $50s while pulling boards up from the floor of a home in Bloomington, MN. The nonprofit company Bethesda owns the remodeled home. Bethesda provides housing and services to the intellectually and developmentally disabled. The remodelers did not profit from the find however; the sack of cash is going right back to the nonprofit and will go toward helping those with disabilities. A Staten Island couple discovered a rusty, decaying metal box buried in their back yard. They dug the box out of the ground as they were planting trees. What looked like garbage turned out to be an old safe. Inside the safe were $52,000 worth of valuables, including $100 bills, gold, diamonds and jade. Papers inside the safe helped the couple determine its rightful owner—their own neighbor! The neighbor’s home was burglarized about seven years prior. The contents were all returned to the very grateful neighbor. A Cleveland, Ohio man discovered old metal boxes in the rafters of his home while remodeling. Inside the boxes and wrapped in old paper were $20, $50 and $100 bills. He also found a gold certificate and star notes (misprinted currency) in the boxes. The treasure’s total value of $45,000 helped pay for the home remodeling project. An ornately-decorated porcelain vase sat unnoticed in an old shoebox in the attic of a house in France. The owners discovered the vase and were curious about its value. So they asked Sotheby’s Paris to appraise it’s value. To their shock and amazement, the vase turned out to be from the Qing dynasty and dating from the 18th-century. It appraised at $590,000 to 825,000 and sold at auction for about $19 million! Hopefully these tales of hidden treasure found in old houses, attics, flea markets and thrift shops have inspired you to go looking for your own valuable discoveries! American Flag’s 15 Greatest Moments in History.